Mixing in larger venues requires more than just extra inputs and outputs - you need effective means of controlling the way that signals are routed, along with facilities such as grouping and mutes that make it easy to deal with all those channels. The Spirit Live 42, in frame sizes from 12 to 40 channels, is designed for just these situations. 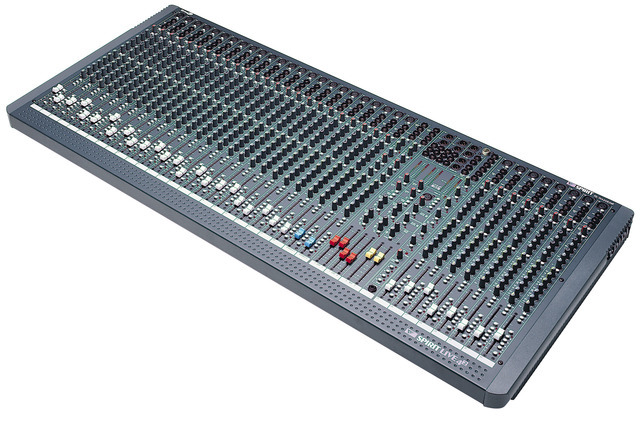 Soundcraft's UltraMic Plus preamp give a 66dB gain range, making it capable of handling a wide range of input signals. The EQ on mono channels is a 4-band configuration with two swept mids, with six aux sends. It has full mute group facilities with four mute groups controlled from the master section. All mono inputs also feature pre-fade listen, 100mm linear faders, insert points, direct channel outputs, individually switchable +48V phantom power, phase reverse, EQ in/out switching and a hi-pass filter. The stereo inputs - two on every 12-channel frame, four on other frame sizes - feature shelving 2-band EQ and six aux sends. It also has a 10x2 matrix in the master section, making it easier to deal with multi-speaker systems in theatre sound reinforcement. The main stereo XLR outputs are ground compensated with insert points and a separate mono output is available to feed a centre speaker cluster.